In January 2000 Fatima Meer enraged ANC leaders by opposing the eviction of destitute families from council flats in Chatsworth, Durban. The ANC’s objective was to sell off the council housing. Meer helped to establish the Concerned Citizens’ Group to organise protests against the ANC’s anti-poor policies like privatisation and cost-recovery, which had led to violent evictions and water cutoffs. The ANC deputy mayor of Durban Trevor Bonhomme called Meer a counter-revolutionary. Watch the video above to hear her response. What is 'left' about 'the left' in South Africa? There was uproar over SACP general secretary and government minister Blade Nzimande's 1.2 million rand luxury BMW. Cartoon by Zapiro. 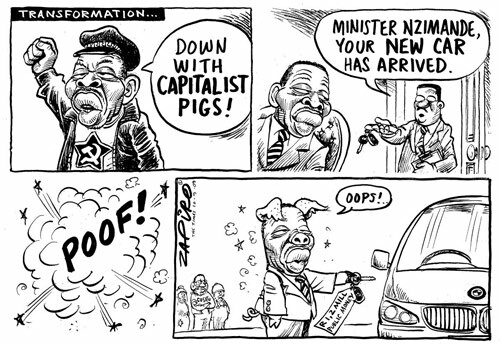 For more Zapiro cartoons, please visit http://www.zapiro.com. November 5, 2009 -- For several years now, but particularly since the ascendancy of Jacob Zuma and his South African Communist Party (SACP) and Congress of South African Trade Union (COSATU) allies within both the African National Congress (ANC) and the state, ``the left'' in South Africa has come to be almost completely associated with (and presented as) the SACP, COSATU and, to a lesser extent, the ANC itself. Even though this state of affairs ignores a wide range of organisations and people that can stake a serious claim to being part of ``the left'', the fact is that contemporary politics in South Africa are dominated, in one way or another, by these three alliance partners. As such, it is a good time to pose a critically important question: What is ``left'' about ``the left'' in South Africa? South Africa: Time for a new democratic left party? October 30, 2009 -- Our country is in crisis. There is deepening inequality, many people live in permanent poverty and millions are unemployed for most of their adult lives. Women continue to suffer from social oppression, violence and poverty. The very ecological and biophysical conditions for our human existence are under threat. Retrogressive ideologies in our society are gaining ground: we are going back to ethnic identity, we have retrogressive notions of womanhood, we have seen the rise in the power of undemocratic rule of unelected chiefs. The state is dysfunctional, corrupt and fraudulent. The state seems unwilling to confront the economic system that produces all these crises. Together, none of these socioeconomic problems can be addressed by a South Africa that reproduces capitalism. These problems require solutions that go beyond capitalist accumulation. Is it correct to regard the Jacob Zuma-led African National Congress (ANC) as left? Whilst the Zuma-led ANC is much friendlier to the left than Thabo Mbeki's, neoliberal capitalism survives in South Africa. A statement by Abahlali baseMjondolo president S'bu Zikode. S'bu and his family have been living as refugees since the September 26-27 violence by the African National Congress targeting Abahlali leaders at Kennedy Road shack settlement in Durban, South Africa. He appeals for continued support for the Shack Dwellers Movement in these dire times of government repression and lies. It can be said without exaggeration that the so-called democratic government of South Africa is attempting to silence and disband the country's largest social movement of the poor. 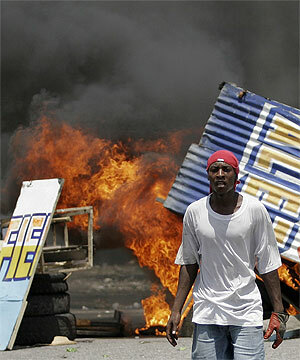 June 13, 2009 -- With high-volume class strife heard in the rumbling of wage demands and the friction of township ``service delivery'' protests, rhetorical and real conflicts are bursting open in every nook and cranny of South Africa. The big splits in society are clearer now. Distracting internecine rivalries within the main left bloc have subsided. 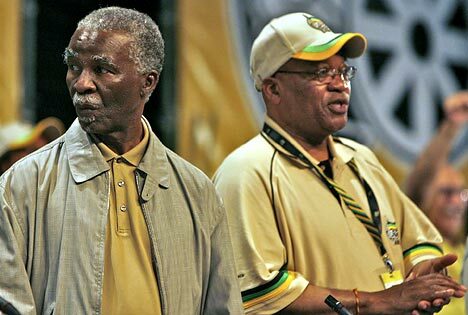 From 2005-09, the ruling African National Congress' huge wedge between camps allied to Thabo Mbeki and to the new president, Jacob Zuma, cleaved the ANC in two, but Zuma's troops have mostly flushed out the former's from the state and party. So the bigger story now is the deep-rooted economic crisis. Government fiddling at the margins with Keynesian policies is not having any discernable impact. A lower interest rate -- down 4.5% from last year's peak (to around 10% prime with around 8% inflation) -- and a probable 5% state deficit/GDP ratio (last year's was a 0.5% surplus) are not nearly enough tinkering to stave off a serious depression. November 15, 2008 -- At some point in the not-too-distant future, we might just look back at 2008 as the year in which things really started to fall apart for the African National Congress (ANC). Africa’s oldest liberation movement, which has enjoyed overwhelming political hegemony and electoral success since South Africa’s democratic breakthrough in 1994, is in deep trouble. Crucially, this is not mainly as a result of the more recent domestic manifestations of the ever-widening crisis of capitalism nor of any kind of immediate threat to its 18-year hold on political power. It is rather more simple — the “big happy family” whose members range from crypto-communists to die-hard capitalists, from ethno-nationalist chauvinists to cosmopolitan liberals — is beginning to break apart because there remains little to hold the heterogeneous clan together anymore. October 25, 2008 -- A far-reaching strategic debate is underway about how to respond to the global financial crisis, and indeed how the North's problems can be tied into a broader critique of capitalism. The 2008 world financial meltdown has its roots in the neoliberal export-model (dominant in Africa since the 1981 World Bank Berg Report and onset of structural adjustment during the early 1980s) and even more deeply, in 35 years of world capitalist stagnation/volatility. Africa has always suffered a disproportionate share of pressure from the world economy, especially in the sphere of debt and financial outflows. But for those African countries which made themselves excessively vulnerable to global financial flows during the neoliberal era, the meltdown had a severe, adverse impact. 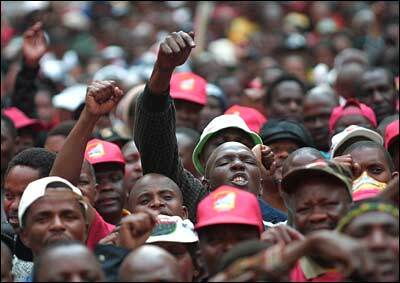 October 14, 2008 -- The SACP wishes to express its appreciation for the invitation to come and address this august body, the 8th national congress of this giant affiliate of the Congress of South African Trade Unions (COSATU). Your congress is taking place at very crucial domestic and international conjunctures which though may seem distinct but are deeply interrelated developments: the global crisis of finance capital and the splinter group from the African National Congress (ANC). I say these are related because we are part of a global capitalist system, whose impact on our shores go beyond just the economic realm, but has had disproportionate influence on our politics as well. September 23, 2008 -- In South Africa, the deputy leader of the African National Congress has been chosen to serve as interim president following the resignation of South African President Thabo Mbeki. Mbeki resigned on Sunday over allegations of interference in a corruption case against political rival and current ANC party president Jacob Zuma. We speak to South African poet and activist Dennis Brutus. September 21, 2008 -- The past week has been a wild roller-coaster ride in and out of Southern African ruling-party politics, down the troughs of world capitalism, and up the peaks of radical social activism. Glancing around the region and the world from those peaks, we can see quite a way further than usual. Looking first to South Africa, September 20's dumping of state president Thabo Mbeki by Jacob Zuma -- president of the African National Congress (ANC) -- and his temporary replacement (until next April 2009's election) by ANC deputy president Kgalema Motlanthe, was an excellent reflection of ruling elite fragility in neoliberal regimes. Some of Mbeki's main supporters, including Mbhazima Shilowa, the former trade union leader and now premier of Gauteng province, in the economic heartland of Johannesburg -- are apparently considering the launch of a competing party.